The Ezekiel is well constructed Gi that is durable and light weight, although it does have some minor issues. I think most people would be quite pleased with the purchase of this Gi, but do note, the slits on the sides of the skirt are cut a bit long. On the flip side, there is some new innovations as well. Probably my favorite feature of the Gi was its introduction of, soon to be revolutionary, felt seam tapes around the wrist. It’s really an ingenius idea that was definitely well received by me in its execution. It’s quite soft and in turn makes the sleeves that much more comfortable. 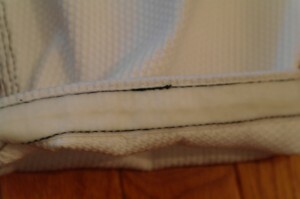 Man, the slits in the side of the Gi are HUGE. They actually come up above my belt line. This causes the skirt to ride up out of my belt quite a bit. However, it doesn’t prohibit my mobilty and I attribute it more to a nuisance than a true functional problem as all of my Gi tops do the same thing at some point during rolling, just not nearly as often.